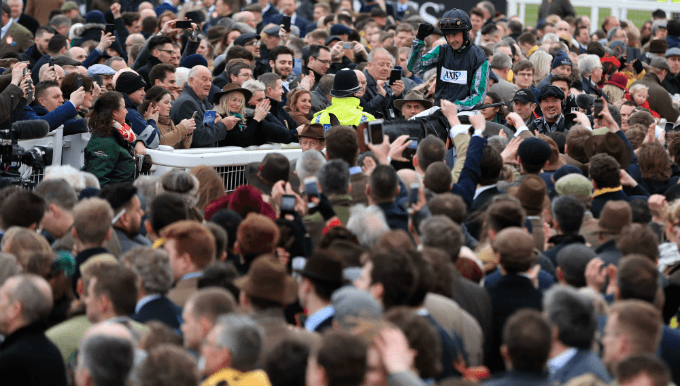 There is no stronger favourite in the Cheltenham Festival's ante-post betting than Altior in the Champion Chase, but that doesn't mean there isn't a bet to be had. His tiny odds of 4/7 with Betfair mean value is lurking for the each-way punter, and Rory Delargy is just the man to find it. Last year’s impressive Champion Chase winner Altior is aiming to equal the record set by Big Buck’s by gaining 18 consecutive wins over jumps, although traditionalists will argue that unbeaten record still lies with Sir Ken, given that Altior and Big Buck’s tasted defeat before setting off on their respective sequences. Whatever the merits of that argument, Altior is an exceptional horse, either taken against his contemporaries or using the measure of history. Since Timeform first started rating chasers in 1963/64, only a handful of horses have posted higher figures over the minimum trip. Altior’s already gained a higher rating than Badsworth Boy, the only three-time Champion Chase winner, and dual winners Master Minded and Fortria. The prospect of further improvement when something can push him to his limit, makes the possibility of matching Sprinter Sacre’s figure a possibility, and it’s no surprise he’s as short as 4/7 to follow up last year’s win. The best way to take the favourite on in the Champion Chase betting is to utilise the each-way markets, and with many bookmakers refunding stakes for horses which don’t turn up (NRNB), we can take a chance on those who are susceptible to injury or likely to run elsewhere. It’s tempting to find an up-and-coming star to take the favourite on with, but if there’s one thing to learn from the history of the race, it’s that while youth can triumph, experience is often more important - 14 Champion Chase winners were aged 10 or over since the first running in 1959. That’s not to say that the veterans outperform younger horses, but there is an inbuilt expectation for the performance of older horses to drop off, which means that they tend to be priced more generously than their form would dictate. A fine example of this was the win of Special Tiara. The 10-year-old had plenty of Champion Chase experience, having been placed in the preceding two seasons, and that record ought to have made him a popular choice for punters looking for an alternative to an almost unbackable favourite in Douvan. He was understandably well-backed on the day, winning at an SP of 11/1, but he had been friendless in the ante-post market as backers deliberately shied away from backing a three-time-loser. The win was very much a bonus for backers, but the place element represented the true value. That was also the case with God’s Own last year, a 10-year-old with two solid previous runs in the race, as well as a second in the Arkle Novices' Chase behind Un De Sceaux. He also appeared to have a slim chance of beating Altior a year ago, his odds of 50/1 and bigger in the run-up to the race massively underplayed his chances of being placed. That angle will always hold true, with ante-post punters always more aspirational than their day-of-race counterparts, who can crunch the numbers in a finalised field knowing the exact parameters, which determine value on the day. I’ve used God’s Own and Special Tiara as examples above and while the latter is clearly on the downgrade at the age of 12, if this season’s results are a guide, the lightly-raced God’s Own looks as good as ever. He's clearly not in the same league as Altior, but now has four good efforts over C&D at the Festival from as many runs. Unlike some of his rivals, he’s not got the option of half a dozen races at the Festival, either, with his sole entry being in the Champion Chase. His efforts this season are at least the equal of what he managed when third to Altior 12 months ago, and in a race which could cut up badly, he could easily be placed while running to his mark of 159 - a key figure according to Gambling.com's Champion Chase trends for placed horses. He’s also adaptable regarding ground conditions, having a reputation as a top-of-the-ground performer, but finished third on soft ground last year. He’s not a horse you need to take NRNB concessions about, but it’s somewhat ironic that the best price out there comes from a firm which will refund your stake if he misses the race. The other interesting one for me at the prices is Fox Norton, who picked up an injury in the King George VI Chase at Kempton in 2017, and made a very encouraging return behind Altior at Ascot recently. For a horse who can be a bit stuffy, I thought that was the ideal starting point, and he went very close to winning this race in 2017, when finishing strongly, but just too late to overhaul Special Tiara. He went on to slam Un De Sceaux and God’s Own at Punchestown over this trip and has an excellent C&D record, finishing third in the Arkle and winning several times, including two runnings of the Grade 2 Shloer Chase. He’s now a 9-year-old, but that’s not a concern, and while trainer Colin Tizzard probably favours the longer Ryanair Chase, he’s still an attractive bet at 20/1 with the money-back concession.